Both animal and human penile tissue synthesize prostaglandins (PGs). Furthermore, intracavernous injection of certain PGs elicits erection in men with erectile dysfunction (ED; Godschalk et al. 1994). It is also well established that PGs are involved in the pathophysiology of atherosclerosis. Since atherosclerosis is a major cause of ED (Virag et al. 1985), it has been suggested that disruption of PG synthesis in penile tissues and related vasculature may play a role in the pathogenesis of ED (Jeremy and Mikhailidis 1990). 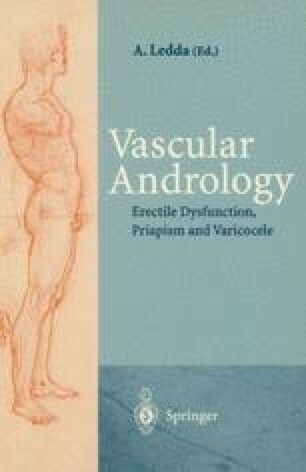 The present chapter therefore focuses on the role of PGs in normal penile erection as well as on the pathophysiology and treatment of ED with PGs and related drugs. Several recent reviews on these areas are of interest (Juenemann and Alken 1989; Jeremy and Mikhailidis 1990; Linet 1993; Miller and Morgan 1994).